We all have those moments when we feel powerless— like our life is not in our control. It’s true, we can’t control life’s ups and downs, but we can control our reactions and how we move through the world. If you’ve only ever used essential oils for relaxing, you’re just scratching the surface of their benefits. Aromatherapy gives you the power to create your own moods and set your intentions for the day. Essential oils are often used in yoga and meditation precisely because different aromas are handy tools to guide your mindset. A crystal (or chakra stone) that visually represents your intention is another useful tool for guiding your thoughts and emotions. Whether you’re using essential oils in your self-care practice or just as a personal fragrance, you have the power to choose the mentality you desire. 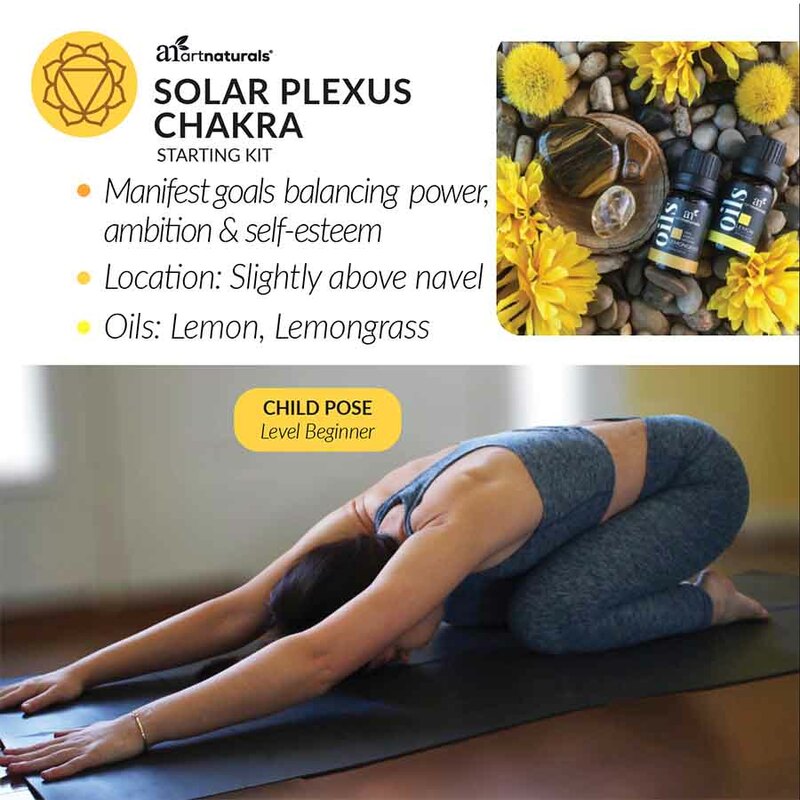 Using essential oils, yoga poses and crystals to support your solar plexus chakra can help you overcome feelings of powerlessness. If you’re not familiar with the idea of chakras, our post about opening the heart chakra has a nifty rundown. To sum up briefly: chakras are specific zones in your personal energy that regulate different areas of your well-being. The solar plexus chakra, associated with willpower, ambition and action, is represented by the color yellow. When you feel powerless, struggle with low self-esteem, or feel mentally stuck, centering your solar plexus chakra can help change your attitude. Using corresponding essential oils and crystals are a excellent way to enhance meditation and yoga because they allow you to set intentions before you even begin your practice. They also work as physical reminders to take your mental and emotional work with you into the world. As a symbol of the sun’s power, citrine crystals support solar plexus work by helping you manifest your goals, attracting personal power and abundance. Tiger’s eye crystals inspire taking action and clear unbiased decision making. Lemon and lemongrass are the most popular essential oils for supporting work with the solar plexus chakra. Although they sound similar it’s important to recognize the differences between these two “power” oils. Lemon essential oil is cold-pressed from lemon fruit rinds. It’s the aroma that you’re probably most familiar with and can readily conjure to your mind. Lemongrass essential oil is steam-distilled from the long sharp blades of the lemongrass plant. Although lemongrass is not related to lemon fruit, oddly it is often described as smelling “more like lemon than lemon.” Lemongrass essential oil has a milder, sweeter scent with a bit of grassiness that brings a freshness similar to herb-based essential oils. Both of these essential oils are generally beloved in aromatherapy for their bright sharp top note aromas that inspire cheerfulness and positive scent memory associations. Both lemon and lemongrass essential oil are also natural bacteria fighters and also linked to spiritual cleansing. The lively aroma of lemon and lemongrass essential oils invite vitality and encourage active energy. 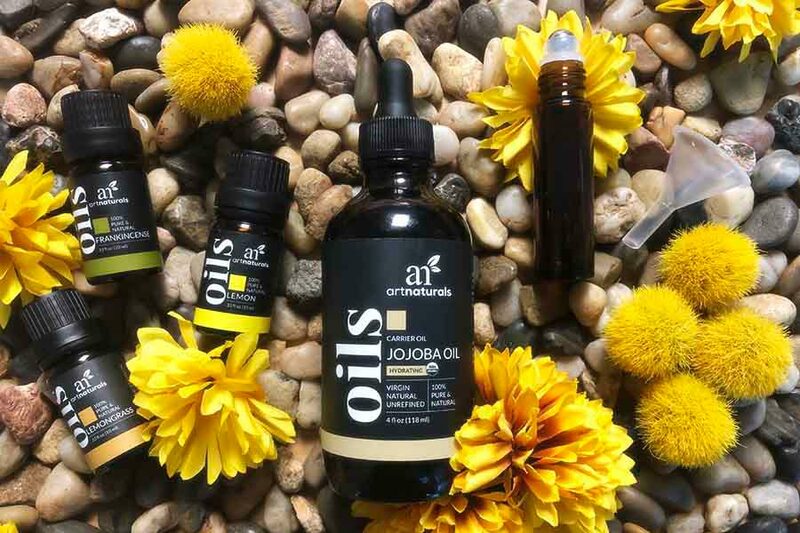 On their own, these two sunny essential oils are a potent complement to solar plexus chakra work. It is also true lemon and lemongrass essential oils are known to inspire cheerfulness and optimism. This can be helpful if your if your feelings of powerlessness are linked to fear, nervousness, and struggling with self-esteem. Pro Tip: To overcome difficult emotions associated with these feelings try incorporating frankincense essential oil to your solar plexus blends to nurture emotional healing. Luckily, lemon and lemongrass essential oils are both awesome for including as a duo or by themselves in DIY recipes. In general, citrus based aromas mix well with a wider variety essential oils than any other type of scent. Wear this roll-on essential oil blend during your yoga practice and afterwards as a reminder of your intentions. When trying new products on your skin for the first time, we encourage you to check for allergies first by performing a small skin patch. Instructions: Use your funnel to fill the rollerball bottle with 2 tsp of jojoba oil. Add 3 drops each of lemon and lemongrass essential oil and 4 drops of frankincense essential oil. Snap on rollerball applicator, cap tightly and shake to mix well. To use, roll on Find Your Power essential oil blend to pulse points, back of neck and temples. Use these essential oils in your diffuser during your yoga practice. Of course you can use lemon and lemongrass essential oils whenever you need to create an empowering moment for yourself. Starting your morning with the Find Your Power blend in your essential oil diffuser is an incredible way to kick off your day! 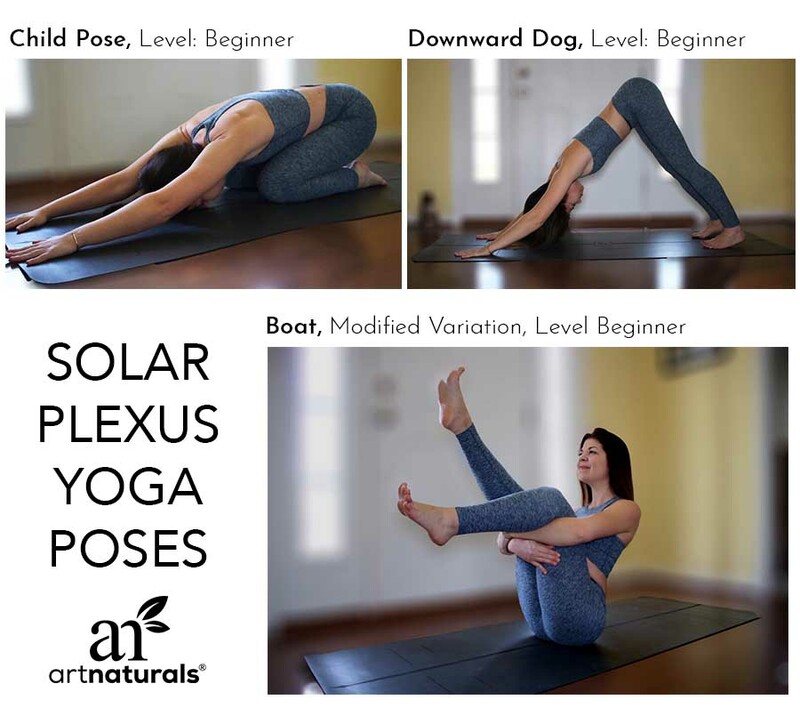 Some of our favorite yoga poses for solar plexus work are poses you may already be familiar with. Child pose (Balasana) and downward dog (Adho Mukha Svanasana) are both beginner level poses. Boat pose (Navasana) can be modified for a beginner level as well, though it’s generally considered intermediate level. Remember, when you’re trying yoga poses for the first time, it’s always best to seek instruction from a qualified teacher. To complement your yoga practice with essential oils, begin diffusing 5-10 minutes before your practice begins to allow the fragrance fill your space. Make sure there’s adequate ventilation so the essential oils don’t become overwhelming. Find Your Power essential oil blend is a delightfully bright and woodsy aroma that feels grounded and full of energy. As you progress through your practice including child, downward dog and boat poses, allow your thoughts to center on the feeling of grounded vitality. Use the essential oil aroma to continue to guide your thoughts through your practice. You may also repeat the mantra “ram” and affirmation “I can” to mindfully connect the aromatic sensation of the essential oils to the yoga poses you’re practicing. What’s Your Essential Oil Power Move? Truly life is not in our control. It’s a glorious, beautiful, frustrating, maddening, chaotic, blissful riot of events that are constantly changing and providing new challenges. It’s okay to feel powerless or fear losing control, the important thing is finding the tools to empower yourself. Lemon and lemongrass are essential oils traditionally used for channeling power. Beyonce chose Lemonade for a reason (so really who is anyone to argue), but your essential oil journey is always your own. What’s your go to essential oil for summoning your best power moves? Share it with us in the comments of this post or find us on social media. Let’s find our strength together!